Last summer we traveled to the New Swan Stone Palace in Germany. It’s built on a rugged hill in southwest Bavaria, Germany. Already heard of its fairytale appearance and eventually, we had chance for a visit. To create the fantasy in the reality, the New Swan Stone Palace has achieved the ultimate. The castle itself merged with the surrounding scene and presents different appearance during the 4 seasons, just like a gem among the mountains. It’s in good shape and because of its fairy tale-like looks it is sometimes called the Cinderella Castle. It’s remarkable, prominent though idyllic look on the mountain hill caused the palace to appear in movies several times, and was the inspiration for Sleeping Beauty Castle at both Disneyland Park and Hong Kong Disneyland and for the Cinderella Castles at the Magic Kingdom and Tokyo Disneyland. However, the beautiful appearance castle with a sad story behind. The palace was commissioned by King Ludwig II of Bavaria as a retreat and as homage to Richard Wagner, the King's inspiring muse. The king is an artist fancier and was influenced mush by Wagner Opera. He composed the palace as where the Snow White in the legend ever lived. He invited many theater artists and stage layout to draw the architecture sketches，fantastic atmosphere and numerous pictures of swans, plus the beautiful deep lake surrounding the castle, it’s as splendid as the worldly fairytale. King Ludwig II of Bavaria was the cousin of Empress Sissi, it’s said he secretly longed for Sissi all along, when he moved into the unfinished castle, Sissi presented him a porcelain Swan as congratulation, so he named the castle as the New Swan Stone Palace. King Ludwig II of Bavaria didn’t like the politics, he fascinated himself to pushing his castle’s creation, due to the building fund and the debt increasing, he was deemed unsuitable for the seat of the throne and lost his power. King during his lifetime did not see his dream completed. The castle was completed by the later generation by years after. So today’s castle we see has the trace of cooperation of the former & the later generation. Now there are millions of visitors per day to the castle, which perhaps the king himself never thought of. Now it becomes one of the symbols of Germany and it’s the most photographed building in its country. The 2 photos attached for sharing & hope you will like it. realy beautiful castle it is! I haven't been to Canada yet but of course plan for a visit. Thanks for your comments! Very interesting and beautiful! I think I have heard about this castle before in my schooling. 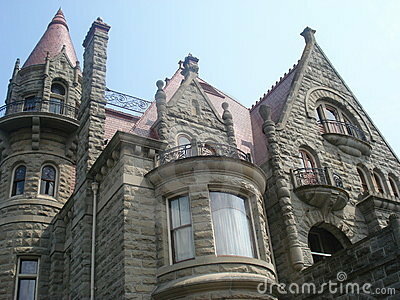 I visited a small castle in Canada a few months ago - Craigdarrough Castle. It was a lot of fun! A beautiful part of the world, and an amazing Castle. Very informative, just to add King Ludwig II was declared insane and found dead in a lake with his physician, there are many that feel this was an assasination of the King and conspiracy theories are readily available for those that love to read up on such matters.